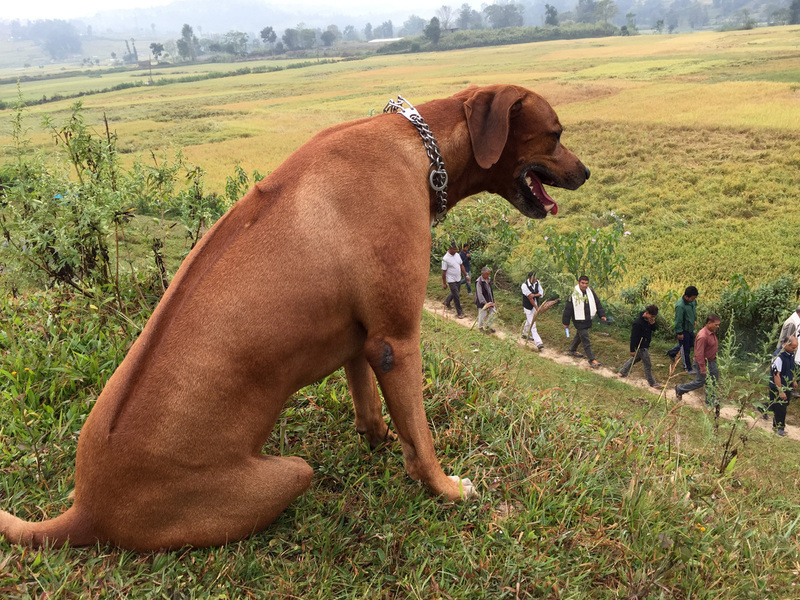 The Globe-Trotting (Mis)Adventures Of Biko, A 94-Pound Rhodesian Ridgeback : Goats and Soda Our 94-pound Rhodesian Ridgeback has moved from Kenya to Nepal — and now to Turkey. It was really ruff. During a weekend run in the Kathmandu Valley of Nepal, Biko and his owner paused as a funeral procession passed by. It takes a village to move a dog. In the past seven years, my family and I have moved to three continents: from Maryland to the Kenyan highlands in Nairobi then on to Kathmandu in Nepal's Himalayas and, most recently, to Ankara in Turkey's central Anatolian steppe. We've repeatedly packed our worldly belongings in a 40-foot-long container and then said goodbye for months as they've traveled by sea via multiple ports and then overland by truck to our next destination. The container has had to navigate through pirate-infested waters, obtuse customs regulations and even complete border closures as when India blockaded Nepal's southern land crossings to the outside world for five months. But nothing has been as anxiety-producing, as logistically complex or as much of an adventure as moving Biko, our 94-pound Rhodesian Ridgeback. I've learned to mix military tactics with diplomatic finesse and, when all else fails, resort to easily summoned tears. The other lesson? I never could have done this alone. My husband, John, gave me a 6-week-old tiny Biko in Nairobi as a Mother's Day present in 2009. He's now a gentle giant who only jumps with excitement when he goes out for a walk, his whip-strong tail destroying anything fragile in its vicinity. He'll chase a cat or a monkey but only rarely deploys his deep bass bark. His favorite place? My yoga mat. Only during asanas. But I didn't realize how huge and expensive he had become until I started organizing his move from Nairobi to Kathmandu. It's always complicated to uproot the family pet. Doing it in the developing world adds innumerable unexpected twists. For starters, Kenya's archaic canine regulations make it more complicated to export a dog than to import one. Inserting an identifying microchip into Biko's shoulder, as required under Kenyan law? No problem for our vet. But the chip had to remain empty as no one in Kenya had the technological know-how to download any of Biko's vitals. We wanted to get Biko a rabies Titer, a test used to measure the level of rabies serum in the bloodstream after vaccination. Although it's unnecessary for Nepal, it's an entry requirement for importing dogs in the European Union as well as many other countries. Of course, there was a hitch. It wasn't available in Kenya. So we had to wait two months for a South African laboratory to process the results. Friends terrified me with details from their dog-moving sagas. One sent her pet solo from Rwanda to Syria via Ethiopia, where he had to change planes and airlines. The poor fellow was misplaced for a few days along the way. When he was reunited with his owner, he was covered with mysterious green parrot feathers. Keeping this tale in mind, I hired a fixer for the plethora of paperwork to be signed and stamped by various government offices, a requirement that had to be fulfilled within 24 hours of our departure. Yep, you have to do it on the very last day. I insisted Biko had to be on our Qatar Air flight. But Biko's size (he is taller than my 5'5" when standing on his hind legs) proved to be a challenge. His kennel barely fit through the door of the only pressurized cargo compartment in Qatar's plane to and from Nairobi. I worried that the kennel did not offer Biko the minimum number of centimeters of headroom required by International Air Transport Association regulations. The next size up, big enough to accommodate a small zebra, demanded a Boeing 747-size cargo door. Sure enough, the day before our departure, the government airport-based vet — the last needed signature — denied Biko permission to fly. I cajoled, then sobbed. All to no avail. With just hours to go before our departure, John mobilized, with the help of Kenyan colleagues, a general assembly with every head of every agency and company that needed to sign off on Biko's trip. He borrowed one of those zebra-sized kennels and like a circus master, proceeded to show how Biko refused to enter the larger kennel but happily jumped into his own. After much debate, everyone signed off, then posed for a group photo with Biko. After the agony of exiting Kenya, Nepal was an unexpected surprise. I had sent ahead a 20-page collection of vaccine records, breeder certificates, pictures, government-stamped permissions and our official entry letter. I assume this did the trick. Biko arrived on the same carousel as our baggage. As a prelude to what became the usual Nepali reaction to Biko, police, airport officials and other passengers, in awe of his size, all gave him a wide berth or ran up to pet and hug him. Fast forward a few years and we needed to move again, this time to Turkey's capital Ankara. But Turkish Airlines, Google, friends in Turkey and the moving company disagreed on what was needed to get Biko through customs in Istanbul. Some said he'd be waved through, others told me horror stories about having their dog stuck in quarantine. Then I heard about a search and rescue dog in transit in Istanbul on his way to Kathmandu just after last April's earthquake. Turkish Airlines cargo mistook KTM (Kathmandu's airport code) for KHI and the dog ended up in Karachi, Pakistan. He was eventually found and rerouted to Istanbul and then mistakenly sent to JFK (New York City). He finally arrived in KTM, days behind schedule, exhausted and thirsty. Turkish Airlines' daily flight to Istanbul was to land at 8 p.m. Though Turkish customs closes at 5 p.m., I was told that there would be no problem processing Biko. Departure from Kathmandu was flawless. During the previous two months, I had visited Turkish Airlines many times to ensure a smooth trip for the dog. At the airport, they cut short the long hours animals usually wait to be processed, allowed a Nepali friend to stay with Biko until he boarded and then came to my seat to ask me what temperature I wanted for Biko in the hold. Ten hours later, we landed in Istanbul, and everything changed. It took another 19 hours before he was released by Turkish customs. The night we arrived, the airline couldn't find Biko in the cavernous cargo barracks. Then, because customs had yet to process Biko, I was not allowed to see him. Eventually, they briefly relented but he was not allowed out of his kennel. By the morning, the government vet, an understanding and very helpful young Turk who spoke English, cleared Biko. Then we got cracking on our next ordeal: seven hours of negotiations at the customs offices, where multiple payments were required as we ping-ponged from window to window over 20 times, frequently sent back to the same people. Communication was a big problem. They spoke no English. We spoke no Turkish. Luckily, John's colleague was able to translate for us. At 4:30 p.m., Biko was finally released. He had not been taken out of his kennel during his time in captivity. We still have no idea why he was detained or what triggered his freedom. We were just relieved to be reunited, and agreed when everyone in the cargo area asked to snap a group shot. I don't think Biko is keen on flying. But here in Turkey, he has settled in well with a vast array of human and canine friends and he is always willing to pose for a photo.